Lynn Morris, bestselling author of The Baron's Honourable Daughter, once again sweeps readers into the Regency era with striking period detail. Lady Mirabella Tirel, the beautiful daughter of the Marquess of Camarden, takes a practical approach to love since a dashing captain broke her heart at age 17. Now at almost 22 years old, she has decided to endure one last London season to secure a suitable engagement and begin a simple life in the country. Sir Giles Knyvet is Mirabella's oldest friend and her most dependable ally, and he is also secretly in love with her. Yet he knows the prospect of a relationship is doubtful: Besides being a mere baronet, he aims to settle a large family debt before sharing his feelings with her. But as Mirabella draws close to a suitable match, Giles may need to interfere to buy himself more time. 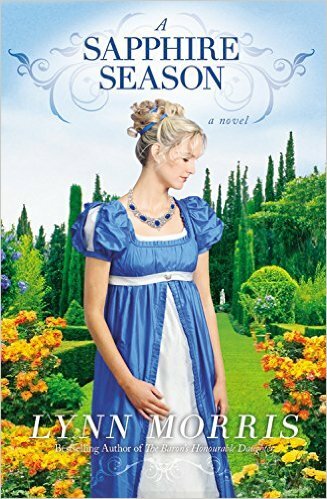 While A Sapphire Season is well written I found this story to be somewhat 'meh'. I read it, but I'm not really sure whether I liked it. The characters, for the most part are likeable and believeable. The plot was okay, but seemed to focus on the "fluff" more than the actual relationships and interactions of Mirabella and the other characters. Parts of this book did frustrate me and I found myself wanting more interaction between the characters - and less description of their surroundings. I found myself wondering whether one particular character had actually seen the interior of a french brothel, it was mentioned so often ... and why the other characters seemed unembarrassed to discuss it. Were brothels openly discussed in polite society, and in mixed company, in that era? Will Josephine fit into London's haute ton? Does Mirabella come to her senses before she loses Giles for good? I received an ebook from the publishers via Netgalley for the purposes of a review, this review is my own personal view and is not required to be positive.